Today, I’m going to look at the 1989 horror sequel, The Stepfather II. The screenplay for The Stepfather II was written by John Auerbach, and it is to-date his only recorded film writing credit. 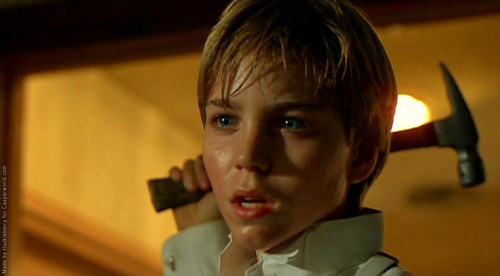 Character credits were given to the writing team from the original The Stepfather, though they had no direct involvement in this sequel. The Stepfather II was directed by Jeff Burr, who also directed the horror films Night of the Scarecrow, Pumpkinhead II, Puppet Master 4, Puppet Master 5, and Leatherface: Texas Chainsaw Massacre 3. The cast for the film included Terry O’Quinn (Lost, Young Guns, The Rocketeer, The Stepfather, Blind Fury, SpaceCamp, Castle Rock, Silver Bullet), Meg Foster (They Live, Masters of the Universe, Blind Fury, Leviathan, Best of the Best II), Caroline Williams (Days of Thunder, Texas Chainsaw Massacre 2), and Jonathan Brandis (Ladybugs, Sidekicks). The editor on The Stepfather II was Pasquale Buba, whose list of cutting credits includes classic films like Heat, Dawn of the Dead, Day of the Dead, and Creepshow. The special makeup effects used in the film were provided by Michèle Burke, a two-time Academy Award winner whose credits include The Cell, Minority Report, Tropic Thunder, Terror Train, and Vanilla Sky. The Stepfather II is, of course, a sequel to The Stepfather, which released two years prior in 1987. While The Stepfather II was not well-received, the franchise continued with The Stepfather III in 1992, and a reboot of the original film in 2009. 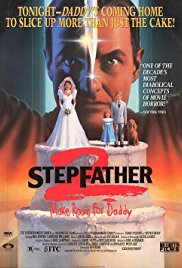 On its initial theatrical release, The Stepfather II was marketed with the subtitle “Make Room For Daddy,” which was apparently dropped for subsequent releases. The Stepfather II was initially made to be a direct-to-video feature, but the producers decided to give it a limited theatrical release in November of 1989, over which it managed to gross roughly $1.5 million. 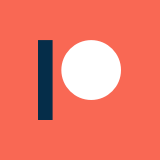 Critically, however, the film didn’t meet with much rejoicing – it currently holds Rotten Tomatoes scores of 0% from critics and 34% from audiences, alongside an IMDb user rating of 5.6/10. 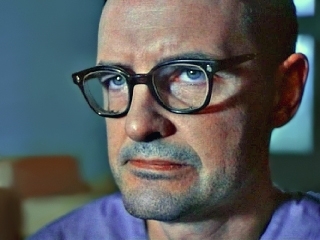 His original performance [in The Stepfather] elicited Oscar-raves, but O’Quinn was working with a great script, a good director and a limited but well-designed budget. He has none of those advantages here…O’Quinn’s fits of rage…carry none of the fury or explosive tension this time around. As Harrington mentions, one of the key differences between The Stepfather II and its predecessor is that the ominous atmosphere and tension from the original’s screenplay is almost entirely absent. While O’Quinn still puts in a raging, memorable performance, without the support of good writing and directing, the eponymous stepfather comes off as more theatrically comical than menacing – think more Corbin Bernsen in The Dentist than Anthony Perkins in Psycho. That is really a shame, too, because I think there was some real potential here for a good sequel – some ideas that weren’t addressed in the original are touched upon, like the sexual values of the hyper-traditional Stepfather, and his inexplicable charm failing to woo everyone he meets. I also kind of like the detail that he is undone by his old-timey “Camptown Races” whistling habit (as an unexpected and bizarre nod to M) – something that was only a minor detail in the first film, but elevated to crucial importance here. All in all, the biggest issue with The Stepfather II is that the screenplay needed more work – the tension between characters doesn’t get to sit for nearly long enough, so the wire never feels taut. The film also might have benefited from less humor, though I appreciated the entertainment value that added in the grand scheme of things. Overall, though, I think this is kind of a fun, goofy, bad movie sequel. It might not have you rolling with laughter, but this is solid late-80s cheese if you have a craving for that.